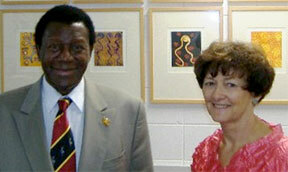 The High Commissioner of the Republic of Uganda, His Excellency Dr James Lukabyo, recently visited Charles Darwin University and met with Vice-Chancellor Professor Helen Garnett. The Vice-Chancellor provided the High Commissioner with an overview of the University and the University’s involvement with Uganda. One CDU staff member, Dr Tony Cunningham has a long history of work in Uganda focusing on basketry, national parks and forest reserves. This has included supervision of Ugandan students and running short courses in Uganda. Professor Bruce Campbell is currently co-supervising a PhD thesis which is focusing on how decentralisation impacts forest use and management in Uganda as part of the Poverty and Environment Network. The Vice-Chancellor and High Commissioner discussed ways of expanding engagement between CDU and Uganda with a particular focus on postgraduate students undertaking research in the fields of health services, education and environment.